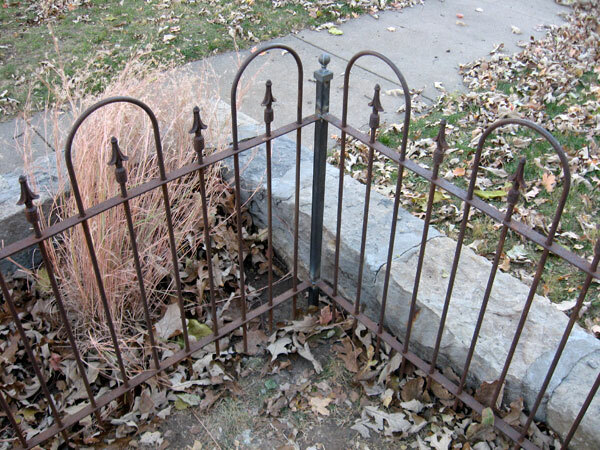 This decorative ornamental iron fence was constructed last summer. The fence was purchased from another company and installed by the homeowner. Simple steel pickets tie the sections together and stick into the ground. Unfortunately, the fence had started to lean. We decided to install posts (set in concrete) every 20 feet or so. This will add strength along the long run of fence (below), preventing sag and lean. We welded the existing sections of fence to the new posts and added ball finials to each. In addition, we also added a post to hang a gate, so the homeowner could access their side yard easier.